I just discovered the greatest food combination ever, and I just HAD to make a blog post about it to share this deliciousness with all of you out there. For 25 days now, I have been adhering to a very strict diet known as the AutoImmune Protocol, which is a variation of the Paleo Diet. This diet, along with a number of supplements, has been prescribed to me for an indefinite period of time until my gut heals, my liver detoxes and my blood begins to accept nutrients again on it’s own. This diet excludes ALL grains, dairy (including eggs), nightshades, legumes, nuts, seeds, sugar and alcohol. And let me just say, the struggle has been real. Once I made it past the initial shock and depression of such a drastic change to my lifestyle (not that I was an unhealthy eater), I started searching for ways to make my food more interesting. Watching other people consume delicious, poisonous foods with no repercussions whatsoever can get a bit overwhelming. I had to overcome my feelings of jealousy and loss somehow, and I knew that experimenting just HAD to lead to some food I could really enjoy. When I began to plan my first AIP Thanksgiving menu, I was looking for some sides that wouldn’t leave me drooling over everyone else’s plates. I am not a huge fan of sweet potatoes, but in the spirit of tradition, I wanted to incorporate them into the meal. I’m also constantly seeking ways to get my full 9 cups of veggies in daily. And then the idea light bulb went off in my head! 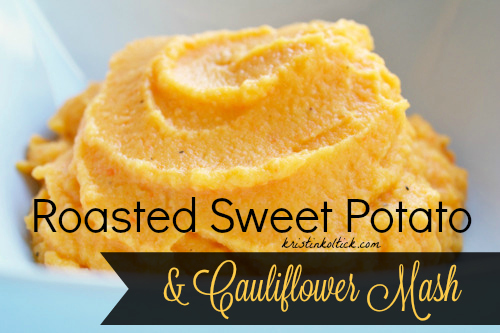 What if I added some sweet potato to my cauliflower mash??? I know I’m not the first person to realize this might be a good combination, but I was really excited about how it would turn out. Once it was finished, I was licking the spatula and scraping the sides of my food processor to make sure I got every last drop. It was THAT GOOD. So, without further ado, here is my recipe! Just food process all ingredients until you get the desired texture. Note: This is a matter of personal preference. The flavor is great whether you prefer lumps or super creamy.